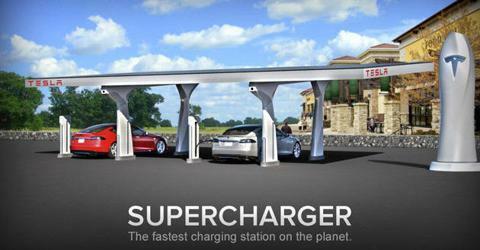 Tesla Supercharging Stations: Another Out-of-the-Box feature from Elon Musk firm. Now that 95% of this year Q1 data is available and looking at the business case of plug in cars, one can say that the only manufacturer making a profit with electric vehicles is Tesla, not only they are selling more than expected, the start up company is also selling each unit with a higher price than predicted, so the Q1 profit only comes as a natural consequence of that. The rest of the market is trying not to lose much money in each unit sold, research and development costs are high, prices have to be realistic and the number of units sold are below expectations, with some CEO's discontent with these obstacles. The truth is that it's a long hard road to electric profitability, but some are closer to than others, Nissan is now nearing 60.000 Leaf's sales (and let's not forget the additional 23.000 batteries sold by teammate Renault), allowing them to recover a good part of the investment and along with other measures, reduce the Leaf's price. Now with the production distributed by three factories, if (and that's a big "IF") they can produce some 2.000 units per factory, we are talking 6.000 units a month and 72.000/year, numbers that can put Nissan on the verge of EV break even point by the end on 2014. Will the tiny Spark make a difference on GM's electric strategy? GM is also taking the same path thanks to the Volt project, but it's lagging behind Nissan, right now they are at 40.000 plus units of the Volt family and this year sales are below 2.000 units/month, as the increased competition dents on Volt sales. With around 40.000 sales in this Q1, a steady 32% increase over '12 Q1, many changes happened in the global Top 10, if 2012 was the year that the Chevrolet Volt took command and other Plug-In Hybrids made their mark, reaching a 50/50 share, by the end of '13 Q1 pure electrics are bouncing back, with the Nissan Leaf back to #1 (even without the japanese sales taken in account) and Tesla's Model S #2 in March and breathing on Volt's neck for #2 YTD, this translates in a rise of 8% of BEV's share to 58%. In March the Top 10 welcomes the Mitsubishi Minicab Miev in #10 and Year-to-Date there are three new models, besides the aforementioned Minicab Miev, its stablemate Outlander PHEV is storming all the way up to #4 and the Renault Zoe has also climbed a respectable #7. Last years runner-up, the Prius PHEV is down three positions to #5 and the C-Max is in a discreet #9, far from the Top 5 positions it had in the last months of 2012. Finally, the Renault Twizy is out of the Top10, with the summer on the northern hemisphere is on its way, there is still hope for the seasonal french BEV to climb again on the chart. By brands, Mitsubishi is up three positions, now in #2 with 19% share (a rise of 12%) and three models in the Top 10, just behind Nissan (20%) and above Chevrolet (14%), Tesla (13%) and Toyota (12%). (b) - Includes Citröen C-Zero, Peugeot iOn. 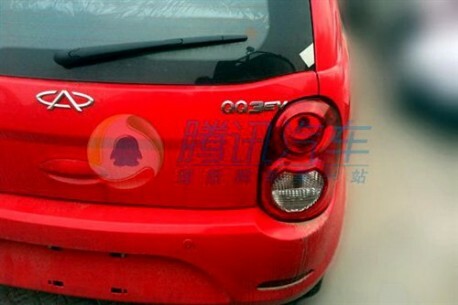 Having sold 5.305 units in 2012 of this little runabout, Chery earned the crown for best selling model and brand in the chinese electric cars chart, with a 44% market share. At just 100 kms, it doesn't have that much of a range, but at some 6.500$ (tax deductions included) it's a bargain. Another surprising presence, the JAC model sold 2.485 units of this compact sedan last year, not bad considering a price on the high side (26.000$) and a range of just 130 kms. Probably the most well known electric vehicle Made in China and definetly the most exported, in its home market the compact MPV sold 2.091 units last year, earning it a bit disappointing third place, maybe the reason behind this is a steep price of 33.000$, making it the most expensive of these ranking. In its last complete year (It will be replaced by the Qin), the only Plug In Hybrid in this chart sold 1.201 units, not bad considering the dated looks. Looking like a past generation Daihatsu Terios (Because that's what it is), the little Zotye SUV sold 845 units in '12 and with the arrival of more fierce competition, it looks that it will have a year full of obstacles to overcome in '13. Analyzing EV's charts by countries, there's changes to be reckoned: In the US, the Nissan Leaf is back to #1, in Japan the Mitsubishi Outlander Plug-In interrupted the Leaf reign and in Canada the Volt had to share the top spot with the Leaf. There are new leaders also in Denmark (Nissan Leaf), Switzerland (Again the Leaf), Iceland (Prius PHEV) and Estonia (Yet again the Nissan Leaf), these last two countries crowned the I-Miev last year, so this confirms the trend that the tiny japanese BEV can't secure its sales when faced with more competitive competition. And right now the Leaf holds #1 spot in 9* countries, not bad, eh? Looking at Plug In market share by countries, it´s a mixed bag: While some are jumping north of the 1% barrier (France, Japan and Sweden) and the all important US market is nearing the 0,5% threshold, most of Europe is suffering with the crisis, the plug-in-friendly Netherlands saw electric market share go down from 1,1% last year to 0,6%, Estonia went down too from an amazing 2,4% in 2012 to a paltry 0,1%, crisis battered Spain decreased from 0,24% to just 0,07%, same story in Austria (0,06% instead of 0,30%) and Ireland (0,04% vs 0,23%) and even EU neutral Switzerland saw it's EV market share reduced to 0,25%, down from 0,42 in '12. Recently there was available new data regarding EV's in China and the numbers are surprising, there were 12.791 EV sales in 2012 and some 3.175 sales in the first quarter of this year, putting China right next to France as the third largest Plug In market in the world and i'll be giving more info on this in the next days. Right now, this data is important because adding China to the other three large EV markets (USA, Japan and France), means that the importance of these 4 major markets is tremendous, putting it in perspective, 7 out of 8 plug ins are sold here, making 88% of all EV sales. It doesn't take rocket science to see that much of the future of plug ins will be decided in these four countries. Even Switzerland couldn't escape a sales downturn, the total market is down 12% and plug ins dropped even more, leading the market share for EV's to drop to 0,25%, down from 0,40% in 2012. This March the Nissan Leaf won the leadership by two units from the Renault Twizy, still #1 YTD. The auto dutch market is down 31% and the plug in segment is suffering even more, with its market share shrinking to 0,64%, when in 2012 it was at a healthy 1,1%. With 144 units sold in March, the Opel Ampera is as always far and away in #1, with the Nissan Leaf and Chevrolet Volt exchanging positions this month, with the japanese relegating the american to #3, although the Chevy is still #2 YTD. The Renault Zoe makes its first appearance, registering three units. Renault has high hopes for the Zoe in the Netherlands, unlike in other euro markets, where it's a dominating force, the french manufacturer is marginal here, scoring just 7% share. Looking at the models ranking, there were only three models selling significantly: The Twizy holds on to #1, selling 93 units YTD, in second the Nissan Leaf sells a mere 34 units and thanks to a good sales month in March (20 units), the Smart Fortwo ED jumps to #3, staying now just 12 units behind the sales it had in the whole of 2012 and promising a good year for the tiny Daimler EV representative. Funky Wheels for an airy, funky car. Will this image become a common sight? The other model to have significant sales in this horrible Quarter was the Renault Twizy with 39 sales, itself down 60% regarding last years performance. In third was the Nissan Leaf with...7 units sold. With a record 1.734 sales and 1,12% share, two thirds of it (1.089) belonging to the new Zoe, the french EV market steps up for another record year, a greater achievement considering that the overall market is declining 16%. We have to question how high will the new french supermini have to get to be considered a sales success, in my view 500 sales/month would be a minimal number, 1.000 would be good and anything above 1.500 would be a resounding hit for Renault. In a distant second was Zoe's utilitarian cousin, the Kangoo ZE at a stable 319 sales, with the Alliance cousin Nissan Leaf achieving third place, reaching the hundreds threshold for the first time since October. Down the ranking there are many models suffering from the arrival of Renault's new Zoe, like the I-Miev triplets (C-Zero down 86%, iOn - 11% and the I-Miev is still at zero in '13), Bolloré (-80%), Mia Electric (-37%) or even their own Renault's Fluence ZE (-95%). 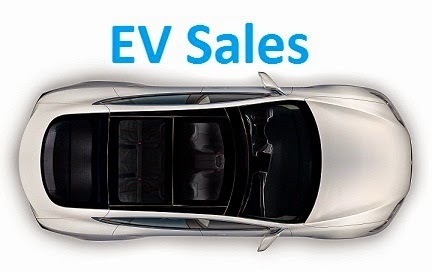 Like in the UK and other countries, the complete australian sales data is only available in every Quarter of the Year, so i can now post EV sales from down under. The Nissan Leaf is going strong at #1 with 36 units and looking to finally get the best seller crown away from the Mitsubishi I-Miev, holder of that trophy since 2010. In second comes the Holden Volt, failing to fulfill the initial promises (In the last two months of 2012 it sold 80 units), selling just 27 cars in three months. Finally in third, the I-Miev, with just 15 cars sold, is starting to fall behind, but we are only at the end of the first quarter and the numbers are still small, so it will have lots of opportunities to catch their opponents until the end of the year. In the Netherlands the title of this post lost a bit of sense, because i didn't had to look for them, as they were about everywhere, especially white Opel Ampera's, but also Plug in Prius (PiP) and some Leaf's and Mitsubishi i-Miev's. Opel Ampera - A company favorite due to tax benefits and sweet deals made by Opel, they are now part of the auto landscape, being driven by young executives of both genders and wanting to show their green credentials. Fisker Karma - I only saw one example of this handsome beast, a grey one parked in downtown Rotterdam, at the time i remembered Fisker's sales success in the Netherlands and the taste that dutch drivers have for stylish cars, realizing then: "Tesla will be sooo welcome here!..." Mitsubishi I-Miev family and Nissan Leaf - Limited to urban areas, they are still a rare sight and fail to ignite interest from company and private buyers alike. With a month delay, i can report on the japanese EV market, the second largest in the world and in a upwards trend, in February there were a record 5.428 plug in sales, translating in an also record 1,59% market share, only second to the champion Norway in EV popularity. The news this month was the rise to #1 of the Mitsubishi Outlander PHEV in its only second month in the market, staying just 7 units behind the Nissan Leaf on the YTD count. In third comes the Prius Plug-in, followed at a distance by the Mitsubishi I-Miev and the Minicab Miev. 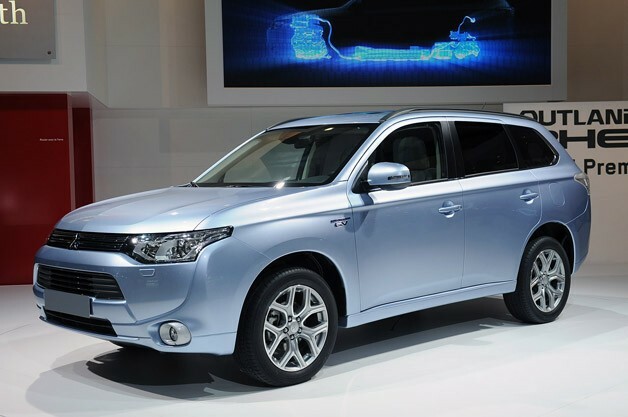 By brands, Mitsubishi benefits from the Outlander to top the ranking possibly for the first time since...2010! The Nissan Leaf goes from strength to strength in Norway, hitting yet another record in sales (297 units) and placement (4th) in the overall market, with the Leaf starting to be build in Sunderland, UK and the price drop that comes with it, it looks like the Nissan will climb even higher in the ranking. On the other hand, it seems that every other car in this segment is suffering from the competition of the Leaf, as they all lose sales regarding 2012, this being the reason for the EV market to register a growth of just 4,88% and the share of plug ins being stable at 3,1-3,2% share. This share will surely grow when the Model S from Tesla arrives, so expect for Norway to be in the forefront of EV market share for quite some time. 1. Gasoline and diesel is heavily taxed here. First with fixed amounts per liter, and on top of that 25% VAT. The result is that a US gallon of gasoline costs around USD8.8. 3. ICE cars are even more heavily taxed. A Volkswagen Golf starts at USD41k. And that's a fairly small fuel efficient car. The taxes are based on weight, hp, CO2 and NOX, so something like a BMW M5 starts at USD304k. 4. EVs are exempt from all purchase taxes, VAT and all. 5. EVs can drive in the bus/taxi-lanes, and since Oslo is one of the more congested cities in Europe, that is a very good selling point. A newspaper here raced an EV against a gas car recently, in rush traffic, and the EV arrived 45 minutes earlier than the gas car. That was a typical commuter route. 1.5 hours per day, around 270 working days per year means 405 hours saved per year. 6. EVs pay a significantly reduced annual registration fee. USD73 instead of USD518. 7. EVs don't pay toll road fees or ferry fees. For a typical commuter, this can be USD2,000 per year. 8. The government has invested significant amounts in charging infrastructure and EV parking, all of which is free to the user. 9. EVs get free parking on any public parking space. In central Oslo, this can be worth USD2,500 per year for a typical commuter. 10. If you use an EV for work, the employer compensation tariff is 30% better. 11. If used as a company car, the valuation for tax purposes is halved. Like in its southern neighbor, the canadian EV market had a good month in March, reaching the 218 record sales it had last December. Still, in a market of 156.000 cars sold in March, the Plug-In market has a symbolic presence, as the 0,13% share can attest. Will the price drop be enough for japanese BEV to secure the top spot in the coming months? While December '12 still holds the record for the best selling month in the US, this March came pretty close to beat it, at 7.881 units sold, just 38 units behind last December. As consequence, the Plug-In share rose to 0,48%, more than doubling share of March '12 (0,21%). With this almost record month there were several models breaking records, starting with this month's leader, the Nissan Leaf, shooting from 653 units in February to 2.236 in March and doubling its sales regarding last year. 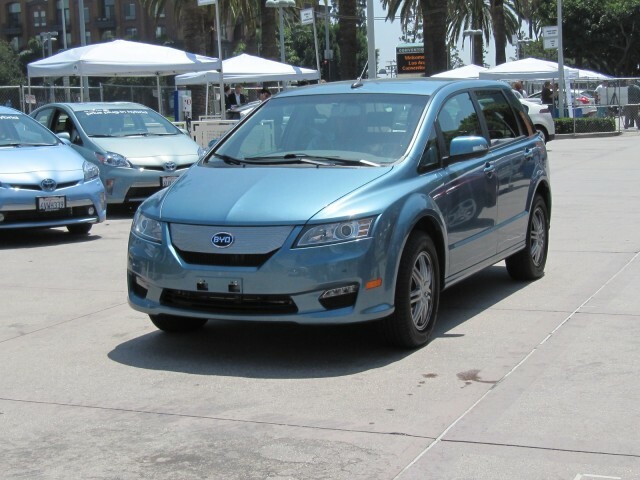 Further down the ranking there were more record breaking, starting with the Focus Electric (180 units), the RAV4 EV (133 units) and the fresh kids Accord Plug-In (26 units) and Fusion Energi (295 units). The early sales from Ford's midsize sedan look promising, this is a model to watch closely in the coming months, just like the Nissan Leaf, it will be interesting to see if it can keep a strong pace in the next months and force GM and Toyota to start discounting more the Volt and the PiP. We start analysing March with the swedish market, down 33% from an all-time record set in February (277 units), but still, at 188 sales, it was the second best Plug-In sales month ever and a stratospheric growth over last year's EV sales (35 units). In the models ranking, the volvo V60 Plug-in collects another pole position, followed by two models at #2, the Prius Plug-In and the Nissan Leaf. The new swedish Plug In seems to be affecting the Prius PHEV sales, recording a weak 28 sales this month and letting itself being caught by the Nissan Leaf, who is having a considerable growth year-on-year, almost tripling its sales. Further down, the Opel Ampera registers it's first two sales of the year, a shy performance considering that last year it sold an average 7 units per month. Another V60 victim? This sales surge from plug ins contrasts with the overall car market, down in March 21% to 22.493 units, resulting in a market share of 0,84% for EV's, not much in isolation, but enough to qualify it as one of the markets with higher plug in share, behind Norway and on par with other markets like France, Japan or the Netherlands.